Xavier Vins is the creation of the noted wine consultant, Xavier Vignon. Xavier Vignon works with numerous domaines in the Southern Rhone Valley including: Raymond Usseglio, La Nerthe, Marcoux, Gardine, Jerome Quiot, Beaurenard, Mont Redon, Maucoil, Roger Perrin and Grand Veneur are just some of the wineries he works with. Before his career really took as an oenologist in the Southern Rhone Valley, Xavier Vignon practiced his trade as a vigneron in several countries and continents, including stints in Bordeaux, the Napa Valley, Chapmagne and Australia. Xavier Vignon is one of the people active in the wine business with dual careers, as an oenologist and negociant. He’s been a negociant since 2002. The combination of those two skill sets formed the partnership that led to producing their own wine. Xavier Vins produced their first wine with the 2007 vintage, and they have not looked back since. 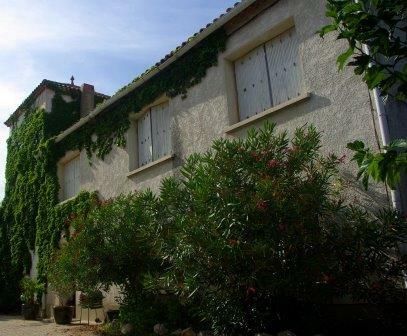 As Xavier Vins does not have their own domaine, the wines are produced in Courthezon at Chateau Husson. Aside from making wine in the Chateauneuf du Pape appellation, Xavier Vins also makes wine in Gigondas, Cotes du Rhone and the Cotes du Rhone Villages, Vacqueyras, Ventoux and Muscat de Beaumes de Venise. Xavier Vins produces 3 red Chateauneuf du Pape wines and 2 Chateauneuf du Pape white wines. Xavier Vins Chateauneuf du Pape was made for the first time from the 2007 vintage. The blend can vary from year to year as the grapes come from perhaps 120 different parcels in the Chateauneuf du Pape appellation. The wine is aged in French oak barrels of various ages, shapes and sizes. Xavier Vins Anonyme made its debut with the 2007 vintage. The blend can vary from vintage to vintage as the grapes are sourced from more than different parcels scattered among the appellation. For example, in 2010, the wine was produced using mostly old vine Grenache from vines that were more than 100 years of age, along with a percentage of other, allowable grape varieties. In other vintages, Xavier Vins Anonyme was produced from blending about 25% Grenache, 25% Mourvedre, 25% Syrah and 25% Counoise. In other vintages, while dominated by Grenache, the blend can include all 13 allowable grape varieties. Xavier Vins Anonyme is aged in a combination of concrete vats and French oak barrels of various sizes and shapes. This is their flagship wine and the strongest wine in their portfolio. This could be the latest released wine from the region, as the 2007 was not available until 2013, which could be even later than the release of Celestins from Henri Bonneau! Xavier Vins La Reserve VII IX X – The wine is a multi vintage blend that was produced most recently from the following 3 vintages, as you can tell from the Roman numerals in the name; 2007, (43%), 2009, (21%) and 2010 with 36% of the blend. Xavier Vins Cuvee Anonyme Blanc made its debut with the 2012 vintage. The wine is produced from blending 50% Roussanne, 40% Grenache Blanc and 10% Clairette. 70% of the wine is aged in barrel and the remaining 30% is aged in stainless steel tanks. Xavier Vins Chateauneuf du Pape Blanc is made from a blend of 40% Grenache Blanc, 40% Roussanne and 20% Clairette, but the blend changes from vintage to vintage. The wine is barrel fermented and aged in the same barrel for 6 months before bottling. Xavier Vins can be enjoyed on the young side. Young vintages can be decanted for about 1 – 2 hours, give or take. This allows the wine to soften and open its perfume. Older vintages might need very little decanting, just enough to remove the sediment. Xavier Vins is usually better with 3-6 years of bottle age. Of course that can vary slightly, depending on the vintage. In the best vintages the wine should be consumed within 4-20 years after the vintage. Xavier Vins is best served at 15.5 degrees Celsius, 60 degrees Fahrenheit. The cool, almost cellar temperature gives the wine more freshness and lift. Xavier Vins is best served with all types of classic meat dishes, veal, pork, beef, lamb, duck, game, roast chicken, roasted, braised, stewed, and grilled dishes, smoked meats, barbecue, sausage, cassoulet, eggplant, tomatoes or cheese. The white wine of Xavier Vins is best served with a myriad of different seafood dishes, shellfish, crab, lobster, sushi, sashimi, chicken, pork and veal, as well as Asian cuisine, pasta, mushroom and cheese. Xavier Vins also produces a few wines from the Cotes du Rhone appellation as we mentioned. But one wine stands out for its uniqueness. He produces a blend of 50% Grenache from the Southern Rhone and 50% Syrah from the Northern Rhone, called. SM Cotes du Rhone. Luscious textures, sweet, ripe, juicy fruits, a boatload of kirsch, garrigue and earthy scents in the perfume and a long, sweet, ripe, spicy, red berry finish that is drinking well young. Really young, but already impressive. Deep in color, the wine is bursting with ripe and very black cherries, kirsch, earth, jam and thyme. Full bodied and concentrated, there is a true intensity of flavor, high alcohol and hedonistic delights that all come together nicely. This seems to be reasonably available in the mid $40 range, which makes this a very good quality to price ratio wine. Showing really nicely, the black pepper, spice, dark cherry, juicy kirsch, mint and herbs are right out in front. Plushly textured, this is a really nice wine that's fun to drink on the young side. The wine was made from a blend of 55% Grenache, 35% Mourvedre and 10% Syrah.